Where to Stay in Hawaii: Advice from a former Hawaii resident and travel writer about the best islands to stay in Hawaii! Includes tips for saving thousands on your Hawaii vacation, plus hotel, beach and other recommendations. We created this guide in collaboration with Cate Brubaker, freelance writer and blogger at The Life Nomadic. Cate called the state’s second-largest city (Hilo) home for 7 years, exploring much of the state while there. Currently, Cate is driving the Pan American with her husband Will and their van, Moby, en route to South America. We’re thrilled to welcome her as our local expert for this Where to Stay in Hawaii Guide. Disclosure: This Where to Stay in Hawaii travel guide contains affiliate links. That means we may earn a small commission when you use the links on this site to book a hotel, buy your travel insurance, shop for travel essentials, etc.. You don’t pay anything extra. If you’d like to learn more about how this works, you can read more under our Disclaimer page. Also worth noting, Entertainment.com provided us with a free 3-month membership so we could research the available deals for this and other guides on this site. All deals and info on this site is provided for general informational purposes. For more info and limitations, please read our Disclaimer. Hawaii is the stuff of dreams. Sandy dreams, sometimes, but dreams nonetheless. Cate spent seven years living in Hawaii’s second-largest city, Hilo. With a population of just over 40,000 people, it’s about as local as you can get, and the locals there would agree! However, the state of Hawaii consists of seven islands, all with their own unique charms, traditions, and changing landscapes. Summing up the state of Hawaii is impossible; the whole is not entirely the sum of its parts. But if you’re willing to unleash your adventurous side and dig a little deeper into the hardened lava and sand, you’re sure to find magic. Hawaii is not just a tourist destination; it’s a mysterious place with a fascinating culture the locals hold with fierce pride. Hawaii welcomes, but also demands respect. If you’re planning a visit and are wondering about the best places to stay in Hawaii, start with this quick guide to Hawaii’s best areas and islands, top Hawaii discounts and deals, and info about how to travel between Hawaii’s islands. We’ve added detailed info about all the best islands to visit in Hawaii later in this Where to Stay in Hawaii guide, but since this guide is so long, we also wanted to provide an at-a-glance summary of our top picks for Hawaii’s best areas. Each of the place names is clickable, and will take you to more detailed info about that section below. In addition to information about where to go in Hawaii, we’ve tried to include other helpful information too But for now, here’s a summary of Hawaii’s best areas to stay! The Big Island: Less visited than Oahu (home of Honolulu) and Maui, the Big Island of Hawaii is nonetheless worth your time. The island’s wild east is home to some of the state’s most beautiful scenery, and the seismic heart of Hawaii’s Volcanoes National Park. The west side is coffee country, with plantations running along the southwest Kona Coast, and drop-dead-gorgeous beaches running along the northwestern Kohala Coast. The Big Island is big enough that many visitors split their time between the west and the east sides, spending the majority of time in the west for a beach vacation, and a few days in the east to enjoy the scenery. If you want to mix ‘beach’ with ‘adventure’, the Big Island might be the best island to visit in Hawaii! Big Island West: Home to Kailua-Kona Town (simply referred to as ‘Kona’ much of the time), the Kona Coast and the Kohala Coast, this is considered the ‘dry’ side of the island. If it’s gorgeous beaches and Kona coffee you’re after, consider staying on the west side of the Big Island. Big Island East: Home to the state’s second-largest city (Hilo) and Hawaii Volcanoes National Park, the east is a great spot to stay for a more adventurous vacation, as there is plenty of wild scenery, but fewer gorgeous beaches. This side of the island is also much wetter. Big Island Travel Tips, Deals & Discounts: Sites & tips for saving money and finding deals on the Big Island. Tips for Getting Around the Big Island: Includes a word of advice about booking package holidays and cars, and Big Island shuttle services, transfers, bus and taxi details. 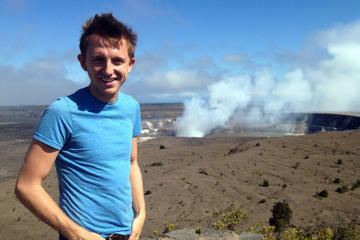 Big Island Activities and Tours: Volcano tours, luaus, and more. 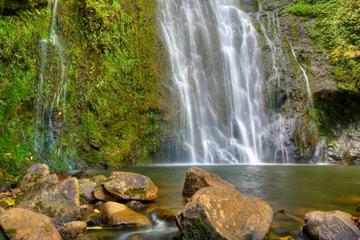 Maui: One of the most popular islands for visitors, it’s easy to fall in love with Maui. With gorgeous beaches, plenty of water sports and aquatic life, the road to Hana, and the dormant Haleakala, there’s loads to do for all types of travellers in Maui. For first-time visitors and those looking for a gorgeous and relaxing tropical vacation, Maui might be the best place to go in Hawaii. West Maui – The most popular spot to base yourself on Maui, West Maui has lots to do when it comes to urban pursuits, as well as some of the best beaches on the island. In West Maui, you’ll likely find yourself around Lahaina, Kaanapali or Kapalua. South Maui – Another popular choice, South Maui’s Wailea resort area is filled with upscale accomodation options. Kihei is an option for more affordable digs, and is geared more towards residents rather than tourists. East/Central/Upcountry Maui – Far less touristy than West and South Maui, there are a few good spots in these areas for getting off the beaten track. Maui Deals & Discounts: Finding deals and money savers. Tips for Getting Around Maui: Rental cars, inter-island flights, shuttles, etc. 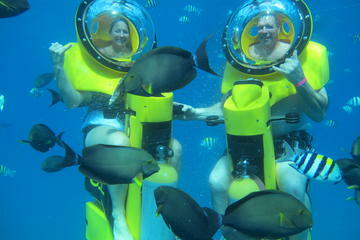 Maui Activities and Tours: Snorkelling, whale watching, and waterfall trip ideas to get you started. Oahu: Home to the big city buzz of Honolulu and Waikiki Beach, and the North Shore known the world over for its surfing, Oahu is the gateway drug of Hawaii: easy for first-timers and long-timers to get addicted to the sun, the surf, and the life on offer. If you’re looking for a beach vacation with plenty of other things to do, too, Oahu is one of the best islands to visit in Hawaii. Honolulu and Waikiki – The capital of hustle and bustle in Hawaii, Honolulu is the state’s largest city, and has the most on offer when it comes to urban pursuits. If you want to stay busy and have a great beach vacation, Honolulu is the best place to stay in Hawaii. The North Shore – Famous for its waves, the North Shore is the place to watch world-class surfing, or give it a try yourself! West Island and Ko’Olina – The calmer, leeward side of the island, the West Shore offers a sleepier, untamed experience. Filled with gorgeous beaches, life in West Oahu is a world away from Honolulu and Waikiki. Great for the more adventurous traveller, and those not interested in being walking distance of all the shopping and dining you can imagine. Ko’Olina is a resort area in the west. The Windward Coast and Kailua – Kailua is a popular, though mostly residential, beach town on the Windward Coast, and is probably most famous for being an Obama favorite for vacations. Oahu Deals & Discounts: Travel tips and deals for Oahu, including the Oahu Go Card and 10% discount at the Polynesian Cultural Centre. Tips for Getting Around Oahu: The low-down on buses, shuttles, Uber, etc. on Oahu. 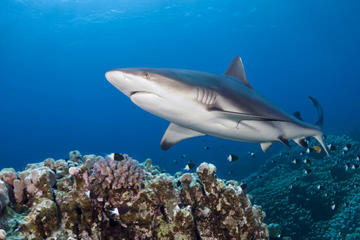 Oahu Activities and Tours: Diamond Head, shark dives, Pearl Harbour and more. Kauai: Hawaii’s gorgeous ‘Garden Isle,’ Kauai is all about lush and dramatic landscapes and gorgeous beaches. 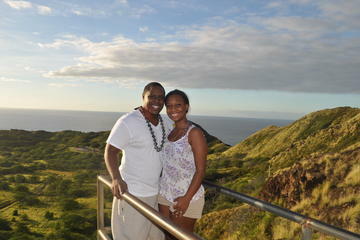 Further off the beaten path than Oahu, Maui, or the Big Island, this is a great spot to truly escape from it all! If you want a relaxing vacation away from crowds, Kauai might be the best island to visit in Hawaii. South Shore – The star attraction on the South Shore is beautiful Poipu Beach, recognized by the Travel Channel as the best beach in America. North Shore – Princeville is a planned resort community in the north, with plenty of amenities to make vacationers happy. If you want to get off the resort, the small towns of Hanalei and Kilauea are worth checking out. East Shore – The most populous part of the island, this is home to the county seat of Lihue. Generally more affordable than the North and South Shores, this is a good base if you plan to have an ‘exploring’ type of holiday. Tips for Getting Around Kauai: Rental cars, inter-island flights, shuttles, etc. 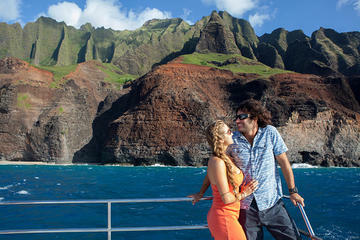 Kauai Activities and Tours: A Na Pali cruise, sightseeing flights, snorkelling and more. Molokai and Lanai: The Hawaii that many tourists never see, Molokai and Lanai offer a version of Hawaii that’s mostly reserved for locals. Molokai – For a low-key, locals’ version of Hawaii, Molokai offers some great holiday rentals. The sleepy cowboy town of Kaunakakai is the heart of the island’s action — if you can call it that — with plenty of rental options to the east and west. Molokai has dramatic scenery and sweeping cliffs. Lanai – Formerly dominated by Dole’s pineapple plantations, Lanai is an arid and rugged version of the Hawaii of yesteryear. The unique Garden of the Gods is reachable by 4×4, and believed to be sacred ground by many Hawaiians. So….Where Should You Stay in Hawaii (A Summary)? Throughout this Where to Stay in Hawaii guide you’ll see links to Hotels Combined. It is a mega-aggregator which compares all the large booking sites like Booking.com, Priceline, Expedia, Agoda, etc – a handy way to make sure you are getting the best deal – Try it Out! Many people confuse the Big Island with Oahu, simply because Oahu is home to the state’s capital, Honolulu. The Big Island, or Hawaii Island as it’s properly called, is less visited than some of its neighboring islands, but that just means you’re more likely to have the beach and attractions all to yourself! The Big Island is very diverse, meaning it has something for everyone, from the very adventurous traveler to family travellers. 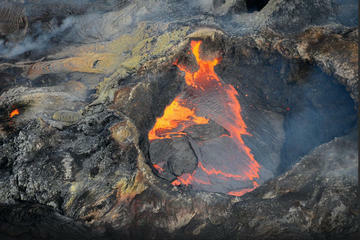 Volcanoes, waterfalls, beaches and coffee are all part of the Big Island experience. The Big Island is more or less split into the west side and the east side, each of which has its own pros and cons, and it’s own access to some of Hawaii’s best attractions. We outlined the Big Island’s different ‘sections’ below, which will hopefully help you decide where to stay in Hawaii. While not a particular popular area to stay, the Big Island is also home to the southernmost point in the United States, simply referred to as South Point. You’ll pass it when you visit Papakolea Beach, one of only four green sand beaches in the world. Like almost everything in Hawaii, this beach was created by a volcano. The sand isn’t sand at all, but rather the mineral olivine. Getting there is a rugged 5 mile round-trip hike or, if you rent a Jeep, you can get there in about 20 minutes from South Point. The turnoff from Highway 11 is between the 69 and 70 mile markers. Don’t attempt this drive in foggy or poor weather! The west side of the island consists of Kailua-Kona town, the Kona Coast, and the Kohala Coast. Kailua-Kona town is the best place to stay in Hawaii for a bit of an ‘urban’ experience on the Big Island (Hilo, in the east is larger, but far more tailored toward local life). The Kona Coast (south of Kailua-Kona town) has lovely accommodations, coffee farms, and the beautiful Kealakekua Bay. The Kohala Coast (north of Kailua-Kona town) is a great choice for a resort vacation and has loads of beautiful beaches to choose from. Pu’ukohola Heiau National Historic Site — A great stop for cultural tourists interested in learning about Hawaiian traditions and culture, this site is located about 55 kms (34 mi) north of Kailua-Kona. The Waikoloa Petroglyph Field — Well preserved petroglyphs dating back to the 16th century (the oldest). Located near the cluster of Waikoloa beach resorts, it’s about a 30-minute drive from Kailua-Kona. Kealakekua Bay Snorkelling Trips — Along the Kona coast, it’s possible to spot dolphins, turtles, bright reef fish, and (sometimes in the winter) whales. We’ve outlined some of the highest-rated accomodation options in each of these spots below. Kailua-Kona itself is a town of about 12,000 people, and is a nice ‘in the action’ base with quite a few shopping and dining choices. South of the town, the Kona Coast has coffee plantations and gorgeous oceanfront scenery, and most places are convenient for getting into town. Overall, Kona is less expensive, less resort-y, and has more shopping and dining choices than when you head up to the Kohala Coast. Holiday Inn Express & Suites Kailua-Kona – A 5-minute walk to the ocean with an outdoor pool, on-site fitness center, and large, comfortable rooms, this is a great option for families and anyone looking for a highly-rated and affordable option in Kailua. If you’re renting a car, this hotel offers good parking options, and past guests seem to appreciate the value. Courtyard by Marriott King Kamehameha’s Kona Beach Hotel – A beachfront property in a great location for beach, shopping and dining, this property has an outdoor pool (with a nearby bar) and on-site beachfront restaurant. The building itself is older, and rooms are functional and clean, but a bit dated. Check out the nearby Kona Brewery! Aston Kona By The Sea – An ocean-front condo complex a short drive from Kailua-Kona, units come with kitchens and laundry machines (wash and dry), making this a great base for a longer-term stay. Units are spacious and modern, with traditional decor and and homey ambience to them. The building has a pool and hot-tub overlooking the beach and ocean. Hale Hualalai – Still within Kailua-Kona, but outside the town centre, this highly-rated B&B offers just two suite-style rooms. The property sits on a coffee farm — chickens and goats included — within the Kona coffee belt, and is just a 15-minute drive to downtown Kona. Past guests love the peaceful ambience and gorgeous setting, as well as the owner (Rick), who makes guests feel at home. Holua Resort – Offering 73 condo-style villas nestled amongst greenery and tropical gardens, this property has a tranquil, tropical look and feel. The large apartments and condos have fully-equipped kitchens, and past guests value them as a good option for families or groups traveling together. The location, just outside of town, made a good impression on past guests, as it was quiet and calm, but near the local market and other shops. Hale Hoola B&B – If you’re looking for a Big Island home away from home, this B&B might be exactly what you’re searching for. Past guests consistently remark about the caring and helpful approach of its’ owners, and with just 3 rooms, you’re sure to have some peace and quiet. Sitting among the Kona coffee plantations in the town of Captain Cook, this property faces Kealakekua Bay. Beyond the volcanoes and beautiful valleys of the Big Island’s rugged east, the Gold Coast (Kohala Coast) is really the star attraction on the Big Island. Filled with lovely beaches and resorts, this is the perfect spot to relax with a cold Mai Tai on a sandy beach! 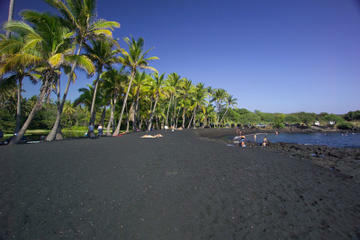 Located north of Kailua-Kona town on the island’s west, this area includes several popular resort areas and beaches. Waikoloa Village and Anaeho`omalu Bay — A coarse sand beach with mostly calm water. Mauna Lani and Pau`oa Beaches — Good options for families with young kids, and those seeking calm waters. Waialea Beach (Beach 69) — Beautiful soft sand beach, but can be quite rocky. Lovely scenery here! Hapuna Beach & Kauna`oa/Mauna Kea Beach — Probably the most beautiful beaches, and good for all types of travellers. Hapuna is far more accessible. In particular, Cate suggests checking out the Hapuna Beach Prince Hotel. Located at the northern end of Hapuna Beach, which is consistently ranked as one of the best beaches in the world, this luxurious and refined hotel is a gem on the Kohala coastline. Stop in for a sunset cocktail or spend your entire stay here; you won’t regret either choice. Four Seasons Resort Hualalai – Capturing the charm and serenity of the Big Island, this property offers breezy oceanfront rooms and a range of amenities you’d expect of a 5-star resort. With 7 swimming areas (including the King’s Pool pseudo-ocean swimming experience and an adults-only pool), a Jack Nicklaus signature golf course, a spa, and multiple dining options, this property is well-located for exploring off-resort sites…if you can muster the motivation to leave. Mauna Kea Beach Hotel, Autograph Collection – A 4-star resort with jaw-dropping views, this property is located on the beautiful Manua Kea white sand beach. A spectacular luxury option if you want to get away from it all, past guests offer up outstanding reviews, with words like ‘oasis showing up in reviews. 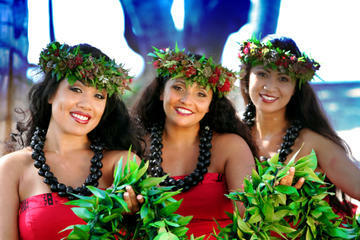 Get a lei on arrival, and then spend your time golfing, and enjoying the on-site bars and restaurants, views, and pool. Mauna Lani Bay Hotel & Bungalows – An upscale white sand resort hotel, this property will keep you busy with everything from on-site golf and spa experiences to handicraft classes and daily newspaper delivery. Offering private beach access, spacious rooms and luxurious bungalows, a large well-kept property, and food and drink, there’s little reason to leave the resort. Past guests mention most (but not all) rooms offer a view. Kings’ Land by Hilton Grand Vacations Club – A highly-rated and family-friendly 3-Star resort that looks more like a 4-star, this property offers four swimming pools and whirlpools, an activity center, golf course, children’s activities, and a babysitting service. According to past guests, the grounds are beautifully kept and the condo-style rooms offer a bit more space. Access to the beach is through the nearby Hilton Waikoloa and a number of shops, restaurants, and beaches are a short drive away. On the east side of the Big Island, Hilo is the obvious base. Hilo is the second-largest city in the state after Honolulu, at just over 40,000 residents, and it’s a great base for a lot of the outdoor and adventure tourism offerings on the Big Island. It’s worth noting, however, that Hilo (and this part of the island) is also considerably rainier than the west side, a point worth considering when you plan your trip. Also, don’t expect stunning beaches in Hilo: it’s a great base for an active vacation, but not so much a lazy beachside vacation. Ideally, you’ll spend some time in both the east and west of the Big Island. The Hawaii Volcanoes National Park — Home to two active volcanoes, the Kīlauea and the Mauna Loa volcanoes, you can visit by car on a short visit, or explore in more depth with hikes. Mauna Kea — A dormant volcano, you can reach the summit in about 2 hours by car, rising up 14,000 feet (4,300 meters) in just a few hours! Note that many rental car companies don’t allow their vehicles be taken to the summit, so a tour may be the best way to experience the summit. Further, there are health and age restrictions for those going beyond the Visitor Info Center at 9,200 feet (2,800 meters). The Hamakua Coast — North of Hilo, the Hamakua coast is an area of drop-dead gorgeous scenery chock-a-block full of all things lush and tropical, including the Akaka Falls and the Waipio Valley Lookout at the end of the Hamakua Heritage Corridor drive. When you’re passing through Hilo, be sure and stop for a meal at Ken’s House of Pancakes to experience a local institution. This Hilo staple has been slinging food since 1971 and is Hilo personified. Obviously famous for its pancakes and the homemade fruit syrups that accompany them, you should also try a loco moco: white rice, a hamburger patty, and a fried egg, all topped with brown gravy. It’s a local favorite! Castle Hilo Hawaiian Hotel – A large hotel with outstanding views over Hilo Bay, this property does a reasonable job at brining a resort ambience to this part of the Island, while being well-located for the city. Past guest mention the spacious and spotlessly clean rooms, as well as the helpful staff. 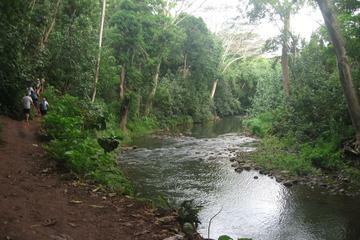 The hotel is located just 5-10 minutes from the Hilo airport and near a number of beaches, walks, and waterfalls. Hale Kai Hawaii Bed & Breakfast – The B&B has four rooms that all face the ocean and come with colorful décor, WiFi, televisions, and semi-private lanai (verandas). As past guests often note, the highlight at Hale Kai Hawaii is the view over Honolii surf beach from the bed and breakfast’s cliff top location. Comfortable and relaxed, this place provides a romantic escape amongst the hills outside Hilo. The Palms Cliff House Inn – Escape the crowds and find a bit of serenity at this pleasant bed and breakfast. Past guests consistently say this is a great base to explore the Big Island, and it is hard to beat the cliff side location near Hilo and Volcanoes National Park. In a location outside of town, the owners provide small items you may forget, such as hairdryers and beach towels, and even have snacks on hand. If you buy a (digital) Entertainment.com membership for $19.99 per year, you can easily recoup the cost of the membership on a trip to Hawaii’s Big Island. The activities discounts alone (see below) could make it worthwhile, not to mention dining discounts (mostly for fast food chain restaurants in Hilo and Kailua Kona), car rental discounts at Alamo, Avis, Budget, Hertz, National, and Payless, and hotel chain discounts. Once your vacation is over, you can change your location to move the savings over to cities across the US and Canada. We’d also suggest you check Groupon and Living Social in the months leading up to your trip and while you’re there. For the Groupon, I’ve found putting in Hilo as your location yields better deals than Kailua Kona. When I checked, there were good deals on a zipline experience and a volcano trip. Obviously, there are loads more deals for Honolulu than the Big Island, but it’s still worth checking! For Living Social, check the Honolulu page, which seems to list deals for all of Hawaii. Hawaiian Airlines offers flights from North America, Asia, and South Pacific to Hilo and Kona airports on the Big Island. Expect to transfer through Honolulu. If you want to explore the entire Big Island, your best bet is to try to fly into one side of the island, and fly out the other side. There is an exception to that, however: if you want to book a complete vacation package that covers multiple islands, then Hawaiian Air seems to be the only way (that we know of) to do this online. The holiday aggregators (i.e. Expedia) only offer one island, one resort type packages as far as we can tell, whereas booking through the airline lets you DIY a multi-island package. When you arrive on the Big Island, note that some hotels and resorts will offer a courtesy shuttle, but most do not. If you don’t plan on renting a car, there are a few options to get to your hotel. SpeediShuttle: One of the most popular and reliable options. We used the booking system to test out a couple of destinations, and the range seemed to be $14-$70 depending on distance. Click here for more info. There is a surcharge for additional baggage, limit of two per person as well as a carry-on sized item, but you’ll pay a bit more for items like golf bags, surf boards and bicycles. Taxi: You’ll find taxi dispatchers at baggage claim A and B. Example fares, Four Seasons Hualalai ~$25-$30, Mauna Kea Beach Hotel ~$65-$75, plus tip. Private Transfer: Hassle free and comfortable, SUV and luxury sedans available depending on your needs, prices average around $50 per person. There is even a stretch limo option! Click here for more information. The least busy of Hawaii’s airports, Hilo only has a couple of regular flights to mainland USA. The airport really only serves cargo and inter-island flights. If you’re landing here, you are likely doing so to head to the volcanoes and eventually heading to the west coast. Car Rental: The best way to enjoy the Big Island is by getting a car and doing a self-drive trip. More info below. Taxi: There are many taxi companies operating from the airport, find them waiting outside the baggage claim. Expect to pay about $15-$20 to the town center, and about $80 to the volcanoes, plus tip, and depending on traffic. Public Bus: Hele-On Bus operates from the airport to town on a limited schedule, 8:00am, 9:20am, 10:40am, 12:00pm, 1:20pm, 2:40pm, 4:00pm, and 5:20pm, regular fare is $2.00 per person. In all likelihood, you’ll need to rent a car on the Big Island to do and see all the things you want. We found that unless you have a membership, the major car rental brands can be quite expensive as compared to booking aggregators. To give you an example, I performed the exact same search across multiple sites, and got rental quotes ranging from $284.08 to $687.05!!! The aggregators I checked — CarRental8 ($284.08) and Holiday Autos ($335.80) — were the cheapest, and the legacy brand — in this case, Hertz ($687.05) — was the most expensive. That said, if you have a membership for one of the big brands or use an, you may be able to get a much better deal! Similarly, if you use an Entertainment.com membership, you can get car rental discounts. I re-searched Hertz using our Entertainment.com discount code, and was able to find a jeep for $487 per week. Be aware, many of the car rental companies have restrictions about driving up Mauna Kea. Maui is one of the more visited islands and it’s easy to see why. A bit more sedate and with more on offer from a tourist’s perspective, this is why people with children, honeymooners, and those who simply want to relax choose Maui (and…of course…those destination wedding folks on their way to get Maui’d). Winter is always the perfect time for a tropical getaway and winter in Hawaii is whale season. The mighty humpbacks make the long journey from Alaska to the warm Hawaiian waters to give birth to their calves, usually from November to February. 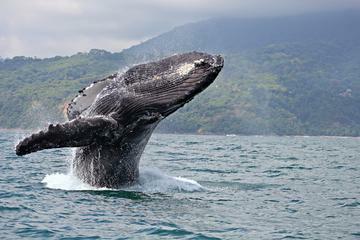 The whales can be seen all over the Hawaiian waters but they seem to love Maui. Expert local guides know where they like to feed and many now use drones to spot them, ensuring that you have the best chance possible to see one of these gentle giants up close on a whale watching tour. For the adventure traveler and the early riser no trip to Maui would be complete without the journey to Haleakala to witness the sunrise. A dormant volcano that is now a US National Park, Haleakala rises to 10,000 feet above sea level. Reservations to witness the sunrise must be made online through the National Park Service and visitors are allowed in starting at 3am. While that sounds early trust me, it’s not. If you don’t want to resort to using your selfie stick to get a photo you need to be there early. Hawaii’s diverse culture has led to some interesting local cuisine. You can dine on expertly prepared, locally caught fish and grass fed beef in a luxury hotel, or you can eat where the locals do. Sugar Beach Bake Shop is one of those places. Obviously famous for their sweet treats what the locals come for is Spam musubi. A simple dish of sushi rice and a fried slice of Spam, all tied together with a sheet of nori, this is the one thing you have to try when visiting Maui. It’s a savory delight. As with everything else, get there early. The locals might have cleared out their daily supply if you don’t. Maui is more or less broken up into West, South, North/Upcountry, East and Central Maui. Most tourists stay in West and South Maui, and that’s what we’ve focused on below. East Maui and Central/Upcountry Maui are also nice for specific styles of travel and to experience some authentic Hawaiian towns, and get off the tourist trail a bit. We haven’t covered central Maui, as it doesn’t hold as much interest from a tourist perspective, with more of a business-industrial focus serving locals. West Maui is probably the most popular area on Maui for tourists to stay and base themselves, and with good reason: it’s full of shopping and dining options, some of the best beaches on the island, and a great base for pretty much whatever activity you’re interested in. If you stay in West Maui, you’ll likely be in and around Lahaina — a town of about 11,000 people — or the resort areas of Kaanapali and Kapalua, home to the Ritz-Carlton Kapalua and resort restaurants, boutiques and golf courses. Lahaina Shores – Each of the 199 condos at the hotel features modern furniture and amenities, including WiFi and fully equipped kitchens. Alternatively, cook outdoors at the poolside BBQ. The clean, spacious rooms come at a reasonable price. The Lahaina Shores boasts an outstanding location on this part of Maui, with the only oceanfront condo rentals in the area and a bit of distance between the hotel and downtown Lahaina. Montage Kapalua Bay – The sweeping grounds include an outdoor pool, restaurant, tennis courts, and fitness center. Each condo comes with a full kitchen, dishwasher, washer, and dryer, which provide a home-like atmosphere amongst the 5-Star service and amenities. The staff at Montage Kapalua Bay receives kudos from past guests for friendly service and accommodating touches. With a location outside the town center, shuttle bus provides great access to restaurants and shops in the area. Napili Sunset Beach Front Resort – Get cozy at this apartment-style hotel, where every room faces the water, pool or ocean, and a number of rooms have patios leading directly to the sand. It is a favorite among past guests for the low key vibe and feel of old Hawaii. The resort is located around 30 minutes from Lahaina and 45 minutes from Kahului airport, on a quiet, oceanfront piece of property. South Maui is another popular choice, and again has great beaches and shopping areas. In South Maui, you’ll likely find yourself staying around Wailea, a resort area with plenty of upscale hotel, shopping and dining options, or south along the beaches. Kihei is an option if you’d like more affordable options – it’s a town of about 20,000 people, and has a local, residential feel to it away from the resorts. Check VRBO for condo-style accommodations in Kihei. Andaz Maui at Wailea Resort – A large 5-star resort that serves up world class service in terms of dining, activities, and spa treatments. Take advantage of the infinity pool and nearby bar or give snorkelling a try at the adjacent beach. These amenities compliment the 290 rooms and 10 villas that past guests describe as comfortable, beautiful, and airy. Kahului airport is only 30 minutes away, but reality may seem much further off. Fairmont Kea Lani – This 5-Star resort just received a $70 million facelift that leaves it sparkling and fresh for guests in the upcoming years. There are three swimming pools, a golf course, and an onsite spa, in addition to a fitness and wellness program that could make your gym back home blush. Guests consistently give high praise to the manicured grounds and spacious rooms. To top off the list of qualities, the Fairmont is near the Makena State Park and Shops at Wailea. Four Seasons Resort Maui at Wailea – Each room and villa at this upscale resort was recently renovated, for a truly updated guest experience. Guests appreciate the layout of the suites and new décor, along with the continued commitment to personalized hospitality provided by a larger resort. The Four Seasons Resort in Wailea opens into a private, sandy beach and is just minutes from the Shops at Wailea and great golf courses in the area. Where to Stay on Maui: Upcountry Maui, East Maui and Central Maui. If you’re looking for something different from the resort vacation vibe of West and South Maui, it’s possible to find places away from the crowds, and with a distinctly Hawaiian vibe. Upcountry: Paia is a cute little beach town, and the ‘cowboy town’ of Makawao is another good option. Central Maui: Wailuku has a larger city vibe, and plenty of cultural attractions. East Maui: While the road to Hana is a popular to-do, if you want peace and solitude, stick around and stay for a few nights! Haiku Inn – Located in East Maui near Paia, the simplicity of this bed and breakfast only adds to the old Hawaiian charm. The rooms are light and comfortable, and feature traditional Hawaiian artwork. According to past guests, the owner provides a welcoming stay outside the bustle of Hawaii’s tourist centers. The Haiku Inn is situated on a plantation site along the North Shore with cane fields, organic farms, and the last pineapple plantation on Maui for its neighbors. The Old Wailuku Inn at Ulupono – A home with a great sense of history would best describe the current status of this renovated and restored bed and breakfast. Past guests portray a welcoming place to stay, with plenty of common space and grounds for relaxing outside the room. The Old Wailuku Inn has a central location in a local town that makes it easy to explore the nooks and crannies of Maui. Travaasa Hana – A 4-Star boutique resort with acclaimed spa, this is a standout choice, even up against the large-scale resorts of Maui. Guests find that Travaasa Hana’s commitment to individualized accommodation and local atmosphere are readily apparent. An upgrade to a beach view hut, over the garden rooms, is recommended. Travaasa is in a local village, not a tourist center, and for that guests are rewarded with fewer crowds. Entertainment.com members can save across the island. As noted above, the digital membership is $19.99 per year, and it’s pretty easy to recoup that very quickly if you’re planning on doing a lot of activities. Once your vacation is over, you can change your location to move the savings over to cities across the US and Canada. 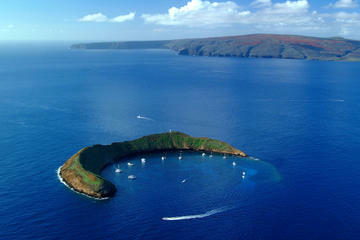 As with the Big Island, check Groupon and Living Social in the months leading up to your trip and while you’re there. For the Groupon, enter in Lahaina as your location. For Living Social, check the Honolulu page. Hawaiian Airlines is currently the biggest player in inter-island flights, and you can fly with Hawaiian or one of their partners from pretty much anywhere to Honolulu. However, they’re not the only game in town: Island Air and Mokulele also operate between the islands. As noted in the Big Island section, Hawaiian Air has a neat feature in that you can book multi-island flight + hotel (or flight + hotel +car) packages through the site. If you use an aggregator like Expedia.com / Expedia.ca, we were only able to find packages to single islands. SpeediShuttle: A cheap and efficient way to get from the Kahului Airport to different hotels and hotel zones is by SpeediShuttle. Starting at $10.11 per person and up based on distance. Two bags per person, plus one carry-on sized item included, extra charges for golf bags, surf boards and bicycles. Click here for more information. Public Bus: Maui County public bus system has two routes that include the airport, The Upcountry and Haiku Islander. Unless you are travelling carry-on, this is not really an option, as according to the website, large baggage is not allowed on the bus. Fares are $2.00, and run every 90 minutes. Taxi: Taxis will be available outside the baggage claim area, find a list of sample fares here. Private Transfer: Travel hassle free and in style. Luxury SUV from the airport to your hotel, residence, or holiday apartment. $150 per vehicle and fits up to four people with luggage. Click here for more information. We tend to use Holiday Autos to rent cars, and they list Maui as a destination covered. I was able to find a compact on Holiday Autos for about $450.00 for a week in April, to give you a point of comparison. Ah, Oahu. Home to the capital city of Honolulu, Waikiki Beach, the set of the hit TV series “Lost”, and big wave surfing. It’s easy for any traveler to get caught up in the hustle and bustle of this little island. But when you’ve grown weary of Honolulu’s epic party scene there are plenty of ways to get a true understanding of Oahu. During the Obama presidency he and his family spent their Christmas vacations in Kailua, on the Windward Coast. One of their traditions was a trip to Island Snow Shave Ice, and you need to go there too. Shave ice is pretty self explanatory: finely shaved ice topped with your choice of flavored syrups, fruit, and even adzuki bean, a Japanese treat. Just don’t dare call it a snow cone; it’s shave ice! The North Shore of Oahu is famous for its big waves, and while just watching the fearless surfers tackle them is thrilling enough, why not take a surf lesson (on smaller waves, of course)? North Shore Surf Girls, located in Haleiwa, specializes in surfing and stand-up paddle boarding (SUP) lessons for people of all ages, and all lessons are taught by women. Perfect for families or anyone who wants to learn to catch a wave this is Oahu at its best. As busy and crowded as it is, one simply can’t overlook Waikiki Beach. While you’re there, be sure to visit Duke’s Waikiki, and try to get one of the coveted seats at the bar, if at all possible. A Waikiki legend named after the famous surfer Duke Kahanamoku, this restaurant and barefoot beach bar is a Honolulu staple. Get there early for happy hour at the bar to see the sunset, and then stay for dinner in their world famous restaurant. Touristy? Yes, but well worth it. Wondering where to stay on Oahu? Waikiki and Honolulu is where most of the hotels and resorts are located, with all ranges of accommodation. For surfing, the North Shore area is where you’ll want to be, which more or less runs between Haleiwa and Turtle Bay. West of Honolulu you’ll find the leeward side of the island, which offers a sleepier and more wild version of Oahu. Think rural towns and hidden beaches which, if you find them, you’ll often have all to yourself. The leeward coast also is home to the resort area of Ko’olina. East of Honolulu, you’ll find the Windward Coast, with the still-residential Kailua serving as the main beach town in the area. Gleaming high-rise hotels, beautiful beach, and plenty of shopping, dining and entertainment options, Honolulu and Waikiki Beach are perfect for first-time visitors, families with kids, and anyone who wants to enjoy a beach vacation with a big city vibe. Hokulani Waikiki Grand Vacations Club – A 4-star Hilton property featuring contemporary, tropical décor with all the markings of a Hawaiian getaway. Guests love the rain shower and updated bathrooms, but the rooftop pool is a definite highlight of the property. The Hokulani has a central location in Waikiki among the main shops and restaurants,with the beach nearby, but according to past guests, the rooms quiet are still quiet. The Surfjack Hotel & Swim Club – True to its name, the Surfjack is a breezy boutique hotel with a laidback surf vibe. Actually more than a hotel, the Surfjack has a restaurant and retail location on the property and offer interesting onsite activities through the Swim Club. Past guests rave about the friendly staff throughout the hotel. Water is never far in Hawaii, and for guests at the Surfjack the ocean is only a leisurely stroll away. The Halekulani – A 5-star luxury boutique located on Waikiki Beach, this property has everything you might need, including 3 restaurants, a lounge with live jazz music, a spa with Polynesian-themed treatments, and a pool overlooking the beach. Rooms come with high-end amenities and a terrace, and past guests consistently mention the exceptional staff and service in their reviews. The laid-back surf town of Haleiwa (where you’ll find the Banzai Pipeline surfing spot) is the heart of the North Shore’s surf culture, but other towns have a lot to offer, too. There’s quaint Kahuku, and the Turtle Bay Resort area filled with resort-style accommodations (including condos); Laie, home to the Polynesian Cultural Centre; and Waialua, among others. Turtle Bay Resort – The views from this 5-Star resort are worth the time to reach the North Shore. Turtle Bay offers kayaking, surfing, helicopter rides, Segway tours, horseback riding, and fishing from the resort, in addition to an onsite golf course and spa. Reviews confirm that activities for the whole family are easily accessible. Located on a small peninsula all its own, Turtle Bay’s closest neighbors are the ocean, tropical greenery, and quiet. Turtle Bay 1-Bedroom Condo – A 1-bedroom, 1 pullout condo that sleeps 4, this property is located at Kuilima Estates West on the grounds of the Turtle Bay Resort. Near to two golf courses, guests have access to 3 swimming pools (each with a BBQ area) and a tennis court. Past guests mention this place as clean, comfortable, and with great amenities…as well as nice owner! Beachfront Home – With 2 queen-sized beds and 4 bunk beds (2 sets), this beachfront home has room for 8. Set on the ocean, and offering a view from the house over a lush green lawn with the sea just beyond, this looks like a great option for groups and families looking for a North Shore base. 10 minutes away from both Waialua and Haleiwa. With white sand beaches and man-made lagoons, the Ko’Olina master-planned resort area is quite possibly a sign of things to come for west Oahu, which has thus far been mostly off the tourist track. With 4 major resorts, a 5th in planning, and several condo-style accommodations, Ko’Olina is an upscale piece of paradise on a lesser visited part of the island. Beyond the resort, it’s possible to find apartment-style accomodation near local beaches such as Makaha Beach. Beach Villas at Ko Olina – Included with the wide range of amenities comes peace and solitude, which according to past guests makes Ko Olina feel like a hidden gem. Every villa includes an ocean view, private lanai, and fully equipped kitchens that were recently renovated and updated. Guests will likely want a car for this destination, as the villas are surrounded by natural beauty, but a fair drive from Waikiki, the North Shore, or Pearl Harbor. Four Seasons Resort Oahu at Ko Olina – A sparkling new 5-Star hotel opened in June 2016, and one of the only luxury hotels to open on Oahu in many years. There are five restaurants, a grab-and-go coffee bar, four swimming pools, and adults-only beach area, among a long list of hotel amenities. 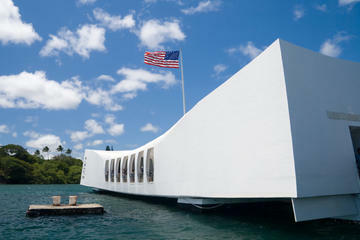 The local marina, golf courses, and Pearl Harbor are all within 30 minutes driving. Marriott’s Ko Olina Beach Club – A relaxing resort that wants to impress even the littlest members of the family. Golf, swimming pools, hot tubs, a lagoon, and spa are all on the property. Guests like that each building has its own swimming pool and are continuously impressed with the level of hospitality displayed by staff members. The Hawaiian Adventures Water Park and Ko Olina Golf Club are less than a ten-minute drive from the resort. Thrust into the national spotlight when the Obama’s chose Kailua as a holiday destination while the First Family, Kailua offers soft sand, family-friendly waiters, and a laid-back beach town vibe. Kailuana Beachfront Apartment – Quaint, self-catering accommodation that offers a unique stay amongst the hotels and resorts of Oahu. This “apartment” sleeps up to 12 people, and includes a dining area, full kitchen, lanai, WiFi, and free parking. During your stay the property is all yours, so feel free to play house and live like a local. Shoes off, stroll the 1 minute to the beach or take on the Maunawili Trail just 3.5 miles away. Walker’s Lanikai Beach House – A historic secret hideaway can be all your own, at this bright, beautiful escape. The home captures so much natural light and bright colors that guests find it is difficult not to be cheerful here. The property has direct beach access, with ocean views from different rooms and living spaces. This self-catering private property is only 20 minutes from the Honolulu Airport. Entertainment.com members can get loads of deals in and around Honolulu. Quite a few of the discounts available are tourist oriented — think helicopter tours, adventure and water sports, and restaurants. A very nice inclusion is discounts at the Pacific Aviation Museum Pearl Harbour. As noted above, the digital membership is $19.99 per year, and it’s pretty easy to recoup that very quickly if you’re planning on doing a lot of activities. Once your vacation is over, you can change your location to move the savings over to cities across the US and Canada. If you want to visit the Polynesian Cultural Centre (which is included in some Go Card Oahu packages…so double check), you can get a 10% discount if you book directly on their website, at least 10 days in advance. Again, Groupon and Living Social are great bets for saving money, especially in larger centers like Honolulu. If your hotel does not offer an airport shuttle, or you are staying in a holiday apartment, SpeediShuttle seems to be the best option. There is a public bus, if you’re packing light, and taxi’s are an option as well. Uber also operates in Honolulu. SpeediShuttle: Honolulu Airport to Waikiki hotels/resorts, $15.48 one way, per person; to Ko’olina hotels/resorts $19.12, and up to Turtle Bay Resort, $167.34. A 10% discount is offered if the return trip is booked at the same time. The SpeediShuttle service also services private residences and prices are based on ZIP code. Click here to see the full price list for Oahu. There is a generous baggage limit of two per person plus a carry-on sized item, but golf bags, surf boards and bicycles are extra. ADA compliant wheelchair friendly service is available with no special prior booking. Taxi: Honolulu has a Taxi Management company that employs dispatchers, who will be wearing yellow shirts that say ‘Taxi Dispatcher” who will summon your cab. There are many companies that offer flat rates, officially, taxis from the official dispatcher will be meterd only. During non rush hour times, expect to pay about $45.00 to Waikiki, plus tip. Uber/Lyft: At the time of writing, both Uber and Lyft operate to and from Honolulu Airport and around the city. According to Uber, drivers must have a special sticker/permit to pick up/drop-off at the airport, presumably the drivers must pay for this privilege, so some drivers will encourage passengers to take the free car rental shuttle for an ‘off site’ pickup. Uber strongly discourages its drivers from doing this, not a big deal, just a heads up. Public Bus: Bus #19 runs from Honolulu airport to Waikiki in about 40 minutes and a ticket costs $2.50. However, unless you are travelling carry-on, this is not really an option. According to the website, large baggage is not allowed on the bus. Private Transfer: Alternatively, book a private transfer to your Waikiki hotel or resort. $35.62 per vehicle for up to 4 people, includes a reasonable amount of luggage. Larger items such as surf boards may incur additional charges. Just a short flight from Honolulu lies the gorgeous and serene island of Kauai. Small, but bursting with Hawaiian charm, Kauai is the perfect island for those who truly want to get away from it all. One of Kauai’s most stunning features is the Na Pali coast. 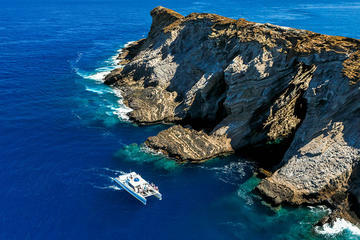 These rugged, beautiful cliffs are best viewed from the water and you’ll find plenty of tour operators who are happy to offer you this experience (or take a sightseeing flight and see it from the air!). Bring your camera; this part of Kauai is a shutterbug’s dream. For the more adventurous you can hike along the cliffs along the Kalalau Trail. It’s an 11-mile hike and is recommended for experienced hikers only. Permits may be required, so check before you go. Another stunning feature Kauai has to offer is the old Kilauea Lighthouse. It lost its light-keeper and has been automated since the 1970s, but the climb to the top offers you a sweeping view of the Pacific Ocean and you may even spot a whale. It’s also home to many migratory seabirds including albatross and boobies. A visit to Hawaii would not be complete without a luau, but skip the one at your hotel in favour of Smith’s Hawaii Luau on the east coast. A family operation 50 years in the making, this is what a true Hawaiian luau is all about. You’ll get to see them digging of the earthen pit called an imu, placing the pig inside, and enjoy some tropical cocktails while you wait for it to cook. Expect hula and fire dancing and an overall evening you’ll never forget. While it can be confusing to figure out where to stay on some of the other islands, on Kauai, it’s actually pretty simple: the island is divided into South and North shores, and East and West Coasts. The South Shore, home to ‘best beach in America’ Poipu Beach. The North Shore, including Princeville, Hanalei, and Kilauea. The North Shore is a bit more off the beaten path in terms of crowds, and is where you’ll find the Na Pali coast and some stunning beaches. However, there’s more rain on this part of the island than the South Shore. The East Coast, which is where you’ll find the airport and the most populated parts of the island, including the county seat of Lihue. The West Coast, including Waimea and Hanapepe. This is the least desirable part of the island from a tourism perspective, so we haven’t covered it below. The South Shore is one of the most popular areas of Kauai, and Poipu Beach is the central point of interest in the area. Named America’s Best Beach by the Travel Channel, it’s easy to see why this part of Kauai holds such interest for travelers looking for a pristine beach and water vacation. Lawai Beach is just up the shore from Poipu, and is good for surfing, rather than lounging, and accomodation here veers more toward holiday rentals than resorts. If you’re looking for more options, put “Koloa” (town) into the search engine on a site like VRBO. Grand Hyatt Kauai Resort & Spa (Poipu) – If you’ve ever dreamt of the archetypical Hawaiian vacation, your dreams probably looked something like this resort. Occupying over 50 acres of land, there’s enough space for 7 restaurants, 6 lounge areas, a clubhouse, swimming pools, a golf course, and spa. Past guests say these large grounds are incredibly well-cared for, creating a tropical paradise vibe. Koa Kea Hotel & Resort (Poipu) – An upscale-yet-relaxed hotel with serious affection and respect for the Pacific Ocean. The rooms, the grounds, and the spa all point toward the water. According to former guests, the staff are friendly and have the balance of chill and sophistication, which found throughout the resort. Koa Kea sits closer to the ocean than any hotel on Kauai, and just outside the resort is one of Kauai’s beloved surf breaks. Koloa Landing At Poipu Beach – A sophisticated resort that features contemporary design, comfortable furnishings, and gorgeous resort grounds. Koloa Landing boasts the largest villas on Kauai, and if that isn’t enticing enough each villa has floor to ceiling windows to capture the awesome views. Guests describe the rooms as being like new and fresh upon arrival. The number of golf courses in the area attracts people from all over the world to this part of Kauai. On the North Shore, you’ll most likely find yourself around Princeville, Hanalei, and Kilauea. Princeville is a master-planned vacation community at Hanalei Bay, nearby Napali, whereas Hanalei and Kilauea are small towns. If you’ve ever seen the movie South Pacific, you may already be familiar with Hanalei’s pier, which was featured in the movie! St. Regis Princeville – Not every hotel can strike the careful balance of rustic charm and sophistication, but this 5-star option does it effortlessly. The rooms are uncluttered and the grounds lush, and past guests mention this hotel offers one of the best views on Kauai: a huge plus on Hawaii’s gorgeous Garden Island. The St. Regis is located in beautiful Princeville, a 9,000 acre community of exclusive vacation homes and resorts. Wyndham Shearwater – Get swept away by Kauai’s natural beauty at this laidback, cliff-side hotel. Guests return from the Shearwater complimenting the friendly staff and incredible views from the hotel’s rooms. For extra space, the suites provide guests with a full kitchen, living area, and washer/dryer. The Princeville community, where the Shearwater is located, is known for valuing natural beauty, great beaches, and access to walking trails. Wyndham Bali Hai – A community of holiday condo rentals within the Princeville community, Bali Hai’s list of amenities includes two outdoor pools, three hot tubs, a children’s pool, and a picnic area. The Princeville community and nearby town of Hanalei provide the perfect combination of outdoor activities, dining, and shopping for a Hawaiian holiday. And while the Bali Hai does not have air conditioning, but most of the time guests found the ceiling fans to be adequate. Known as the Coconut Coast for its abundance of beautiful coconut palms, this part of Kauai is the most populated, with Lihue serving as the county seat and largest urban center on the island. Situated in between the north and south coasts, this is a not bad area to base yourself if you want to explore both, and would rather combine lounging on the beach with a more active holiday exploring the island. Generally, accomodation on this part of Kauai is more affordable, and while the golden beaches are nice, they’re not as drop-dead gorgeous as the north coast. Kauai Beach Villas – A tropical condo-style resort that offers visitors a bit more space and privacy during their stay. It is a beautiful property with an outdoor pool and spa, with past guests mentioning Villas G and H have the best ocean views. While the hotel sits near the sand, the beachfront at Kauai Beach Villas is not suitable for swimming; luckily, there are swimming spots further along the famous Coconut Coast. Kauai Marriott Resort – Take a dip into Kauai’s luxurious side at this upscale resort. The outdoor swimming pool is the focal feature of the resort’s property, surrounded by palm trees and plenty of seating – it nearly outdoes the ocean views. Past guests have loved the vast property, private beach, and lack of crowds: perfect for a relaxing Hawaiian getaway. To top it off, the cliff side location is still close to Kauai’s largest city. Kauai Beach Resort – This boutique resort is filled with natural elements that seamlessly blend with the many outdoor areas provided for guest use, such as large outdoor pool, hot tubs, and fire pits. To explore beyond the resort, Kauai Beach Resort provides complimentary rental cars for their guests to use during their stay. A remote location means guests can feel slightly isolated, but many appreciate the peace and quiet. Hawaiian Airlines is currently the biggest player in inter-island flights, and you can fly with Hawaiian or one of their partners from pretty much anywhere to Honolulu, at which point you’ll need to transfer to a smaller flight. In addition to Hawaiian Air, Island Air and Mokulele also operate between the islands. As noted in sections above, if you’re looking for a flight + hotel (you can also add in car rental), Hawaiian Air lets you book multi-island flight + hotel (or flight + hotel +car) packages through the site. If you use an aggregator like Expedia.com / Expedia.ca, you can book single island packages. SpeediShuttle: Once again, the ever popular SpeediShuttle offers cheap and reliable shuttle services to Kauai hotels. Starting at $10.11 per person, two pieces of luggage plus a carry-on sized item per person is included, extra bags, golf bags, surf boards and bicycles are extra. Click here for more information. Public Bus: Bus #70 runs from Lihue airport to Lihue town center. These are very small buses, so if you are travelling light, or on a day trip, this might be a good option. $2.00 per passenger. Taxi: You’ll find a taxi stand outside the baggage claim area. See sample rates here. I found a one-week rental via Holiday Autos for about $450.00 in April. Prices will of course shift based on season. Two of the least visited of the Hawaiian islands, Molokai and Lanai are two of the most unique of the islands and definitely deserve more attention than they get. Both are easily reached by flight from most of the other islands (Hawaiian Airlines is reasonable), and by ferry from Maui. These two islands have a truly special and local vibe and deserve to be added to your itinerary. One of the most important and interesting things about Molokai is its history as a leper colony. Properly referred to as Hansen’s disease it began to spread through the islands in the late 1800’s. Then King Kamehameha ordered all those stricken with the disease to isolation on Molokai. More than 8,000 resided there since the colony’s inception and some patients are still living. Visiting there is permitted but you can only do so through a licensed tour operator. The journey is long and is usually done on the back of a mule. This isn’t ideal for everyone and children are not permitted but it’s a fascinating look at a dark time in Hawaii’s history. As Hawaii’s smallest inhabited island Lanai feels like a step back in time. The typical luxury resorts do exist here but exploring on your own is perhaps the best way to get a true sense of this little island and for that you’ll need a Jeep. Garden of the Gods is one of the most unique features of Lanai but can only be reached by four wheel drive. Giant boulders draped in beautiful colors live here and many native Hawaiians believe it is sacred ground. Treat this area with respect but enjoy it; you may never see anything like it again. If you’re looking for glitzy resorts, Molokai isn’t the place you’ll find them. Instead, you can have your choice of holiday rentals. Kaunakakai, in the centre of the island along the south shore, is the main town, and may invoke a ‘time traveller’ feeling deep within. Most of the action on the island is in the centre and in the east, with the west having a much lonelier vibe. Condo on the Ocean (East Island) – A charming waterfront condo that was recently updated by its new owners. It is best as a romantic getaway or honeymoon destination, as it only sleeps two people, but there is a full kitchen, living area, and ocean views to make your stay comfortable and easygoing. Guests say they feel at home when staying at this property. It is a good choice for walking beaches and putting your feet in the sand. Secluded Oceanfront (East Island) – A contemporary condo that is ideal for a couple or solo traveler to unwind. While only a 1-bedroom condo, former guests say it is clean, private, and the kitchen well stocked. The accommodation has access to a number of shared amenities, including a swimming pool and tennis court. The condo sits on the 3rd floor of a building, providing some great views to the water. Close to Kaunakakai (13 mi). Maunaloa 2 Bedroom Condo (West Island) – A breezy rental property that highlights the light, salt, and sea of Hawaii. The condo is arranged for a family or group of friends, with potential to sleep 6 people and 2 bathrooms. Hearing the ocean from your room or the private lanai is a fantastic way to spend the evening according to former guests. The beach is located just beyond the property line, making this a great condo for beach bums, surfers, and those who love the sand. In stark contrast to much of Hawaii, Lanai is arid and dry, and almost entirely without the glitzy resorts you’ll find elsewhere. Interestingly, Lanai is also mostly privately owned, and has been since the 1970s. From the 1920s to the 1980s, the island was owned by the Dole food company, who used the land for pineapple plantations. In 2012, Oracle founder Larry Ellison bought the island, and is reshaping it in his own vision. Today, Lanai is a dusty and dry version of the Hawaii of the past, but the winds of change — of luxury resorts and eco projects — are palpable. Most accomodation is clustered along the south coast at Kapihua Bay, or in Lanai City. If you’re looking for an adventure, base yourself in a vacation rental in Lanai City and rent a jeep to get around the island. If you’re looking for relaxation, the Four Seasons is currently the best bet. Hopefully, we’re answered most of your Hawaii questions and given you an idea about the best area to stay for your trip. However, we’ve also included a few travel tips and answered some questions we know you’ll probably be wondering about. As we get questions from more readers, we’ll do our best to update this section over time. So What’s the Best Island to Visit in Hawaii? Whether you’re looking for a tropical paradise resort experience or an off-the-beaten-path adventure, Hawaii has something for everyone. From the towering hotels of Honolulu to the old plantation feel of Lanai City, the range of places to stay in Hawaii is staggering. We’ve tried our very best to summarize the pros and cons of each of Hawaii’s different islands below. For first-time visitors wondering to go in Hawaii, Oahu and Maui are probably the best places to stay in Hawaii….at least for a start. Honolulu/Waikiki and West Maui provide great introductions to the islands, and are great choices for an easy, breezy holiday. If you’re travelling as a family and wondering the best place to go in Hawaii with kids, you’ll probably do well with Oahu and Maui (great beaches and plenty to do), Kauai (laid back beach vacation), and the Big Island (especially for older kids who won’t be scared by the volcanoes). For those hoping to mix some beach time with some more active and adventurous travel, the Big Island is hard to beat. If you’re looking for a gorgeous beach vacation while also getting a bit off-the-beaten-track, consider Kauai as one of the best places to go in Hawaii. And if you’re looking for more of an adventurous vacation, consider going where few tourists do, and visiting Lanai or Molokai. Hawaii Travel Tip: How to Get To and Around Hawaii? Hawaii is easy to get to; almost every major US carrier has at least one daily flight to Honolulu on Oahu, Kailua Kona and Hilo on the Big Island, Kahului on Maui, and Lihue on Kauai. 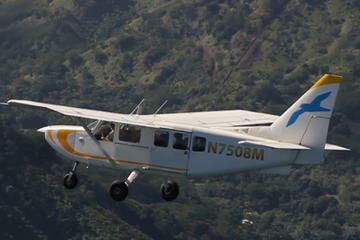 Unless the place you land is your final destination you’ll need to hop on an inter-island flight. Hawaiian Airlines, Island Air and Mokulele operate between the islands. None of these flights are longer than an hour and there are stunning views to be had, especially on the approach to Hilo from Honolulu where, on a clear day, you can see the mighty Mauna Kea in all her glory. Note, if you’re planning on taking multiple airlines during your stay, baggage allowances could change from airline-to-airline. It’s worth checking each policy before booking, and planning your packing list for Hawaii carefully to be sure everything fits! Each island has a bus system although, with the exception of Honolulu, they’re not entirely efficient. Most visitors choose to rent cars and all the major rental agencies are represented, and you can also book through aggregators like Holiday Autos, or book a flight + hotel + car package using an aggregator like Expedia.ca or Expedia.com. Cate’s advice is to at least consider ponying up the extra cash for a Jeep Wrangler. There are some places in Hawaii you just can’t go without a sturdy 4×4. Taxi service is available in most towns and Uber is only available in Honolulu. Most major hotels and resorts offer shuttle service. Ferry service is available between Maui and Molokai and Maui and Lanai. My first worry was that the digital membership would be ‘less than’ the physical books. The books, if you’re not familiar, are tied to a specific geographic region. So if you buy a Seattle book, all the deals within the book will be for Seattle, as well as some national deals. The nice thing about the digital membership is you can change your location. It doesn’t matter where you go within the US and Canada — you’ll have access to the same discounts as the physical book for that location lists. So if you live in Phoenix and you have the digital membership, and then you decide to take the family on a Florida vacation, or a Hawaii Vacation, or a Toronto vacation, you have access to all the coupons in Florida, and Hawaii, and Toronto, through digital. Our hope with this Where to Stay in Hawaii Guide (and all our Free Travel Guides) is to make it easy for you to plan a trip to Hawaii, from finding the best island to visit in Hawaii, to finding the best town to stay in, and then figuring out how to enjoy your time there. That’s why we hire local writers, or people who know a city/region really well, to write these guides. We pay them to impart their their knowledge, in the hopes it makes your trip better! But, of course, locals don’t live in hotels, rent cars or take tours, And it’s not realistic (or financially feasible) for us to send someone to 30 different hotels to try them out, and then take every tour, and try every rental car company – you get the idea. In the past, we’ve simply outlined the neighborhoods or regions, and left the other research up to you. But based on all the emails we received, people also wanted help choosing a specific hotel, and wanted ideas about what to do. So we came up with a compromise, based on research and online reviews, and local knowledge. We end up doing loads of research and read reviews from past guests and participants (where available), and then cross-check that against the local knowledge we’ve developed for the city or region. We ask ourselves if we’d give these listings to our moms, our BFFS, and our old work acquaintances if they were travelling to Hawaii, and if it passes that test, we add it to the list. Really, we want to help you have a fantastic vacation to Hawaii be it a grand Hawaiian tour or a short Hawaii beach break. And, we want you to be able to do so without spending hours on the internet, reading reviews and cross-checking locations on a map. Hopefully we’ve succeeded…but please don’t blame us if we haven’t – at the end of the day, we expect you’ll check the most recent reviews and specific conditions in the city, using our listings as a starting point and framework, and choosing then selecting the best hotel and area to stay in Hawaii for your own trip! Inexpensive place to stay for 3 nights, 2 people, Northwest Kohala coast perhaps. Will be staying at Hilton Waikiki Beach for 1 week March 29 to April 4. First 3 nights March 26 to 29 someplace with things to see. Thank you.